UND hockey has a rich tradition of excellence; nine national championships speak loudly to it. Maybe it’s time to support that excellence by vocalizing support for the team that’s on the ice, in the classroom and at the alumni center. I’ve always been a fan of University of North Dakota (UND) hockey. My father was in school there when I was born, and my folks used to take me to games all the time. Through the years, I’ve been happy when the teams have had success. But if you’re familiar with UND hockey, you understand how those two sentences describe a sadness that’s hard to miss in the Ralph Engelstad Arena. However, this is not a column about the loss of the university’s long-time moniker, or everything that’s wrong with a Native American mascot, or the NCAA’s hypocrisy in forcing schools like UND to change while allowing others, like the University of Utah Utes or the Florida State Seminoles, to retain their names. Instead, it’s about people who have lost their identity. And it’s about supporting the student-athletes, the team and the school. UND students, teams and alumni have proudly called themselves Sioux for decades. There’s tradition there, not to mention honor and deep pride. I imagine UND alumni and fans feel something like that, too. I know that’s the feeling of many people at the hockey game last Friday. It was my family’s first trip to the Engelstad Arena, and by some miracle we’d managed to land front-row, right-up-against-the-boards seats next to the penalty box. 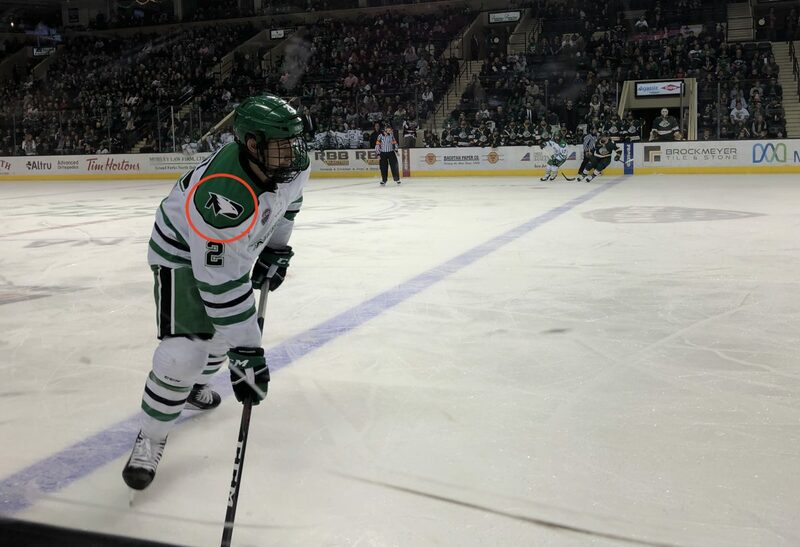 The UND Fighting Sioux hockey jerseys worn by the people immediately behind us and around the stadium made it obvious they were long-time, avid fans. Their reaction every time the announcer said “…your Fighting Hawks!” made it painfully clear. Over the PA announcer’s “Hawks!” they screamed “Sioux!” It echoed around the building. 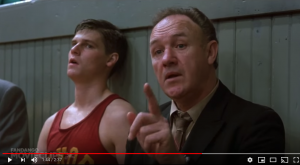 It made me think of a great scene in “Hoosiers,” when Coach Norman Dale declines to substitute an obstinate kid who’s refused to follow his system, even though it’s the end of the game and someone has fouled out. The referee comes over and says he needs a fifth player. Coach Dale points to the four players still out there. The UND hockey team was down 3-1 going into the 3rd period, but scored three goals in 90 seconds to take the lead. Every time the call of “Sioux!” went up from the stands, I felt a tinge of sadness. Sadness for the alumni and fans who have lost a major element of their identity. For the UND coaches, players and students. For Native Americans who do not want their name used for something as trivial as a mascot. And about the fact that people are detracting from the talent and hard work of the student-athletes in a futile attempt to forestall the inevitable. One has to wonder, how long will their majority in the Engelstad Arena stands last? Players are being recruited to UND for a wide range of sports right now – not to mention musicians, artists and future physicians. For better or worse, they are Sioux no more. The Fighting Hawks are here now, giving us their dedication, hard work and all kinds of amazing talents. The university is creating new knowledge, shaping future leaders and impacting the future. And there will be new generations of alumni and fans who are, and forever will be, Fighting Hawks. 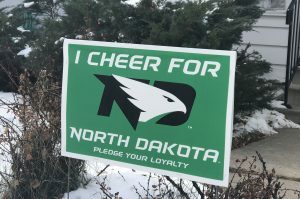 Yard sign in Fargo, N.D. The UND hockey team won the game. Awesome. Great fun. Big smiles all around. On our way out, I found myself thinking that, good, bad or ugly, I had just witnessed remnants of a lost past. And I wondered if Sioux fans will ever follow Coach Dale’s lead. Wear the jerseys if you must. Hang the regalia on your walls. Relive the glory days. Our team is on the ice.